Lucky, left, and Flo, were trained to find DVDs hidden in boxes, envelopes or other packaging. Try this at home. Take your favorite DVD, hold it up to your nose and give it a big sniff. Now take that DVD, seal it in a can of meat, bury it in some old socks, place it in a suitcase and see if you can still smell it. Come on, it's not that hard. In fact, a couple of lovely ladies, Flo and Lucky, can find the discs every time. 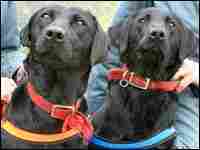 Flo and Lucky are black Labradors and they're being used in Britain to sniff out bootlegged or counterfeit DVDs. The movie industry loses billions of dollars a year to pirated movies. 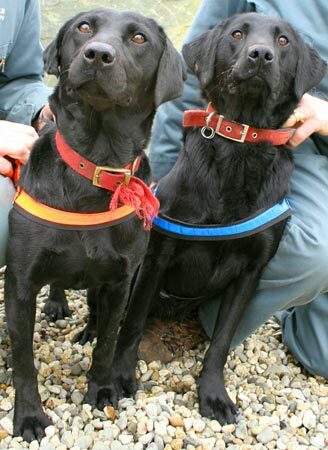 So in an effort to intercept illegal discs, U.S. and British officials sent Lucky and Flo to smell school. After graduation, the girls went to a FedEx warehouse outside London. They nosed through dozens and dozens of packages to see if they could get a whiff of Tom Cruise or sniff out The Da Vinci Code. This morning on NPR, you can find out how the labs did. By the way, the reward for finding a DVD? A soggy tennis ball. Flo and Lucky need a better agent.